Talking about finances with your kids can be difficult. But conversations about money early on promote sound financial habits later. And because children aren’t learning a great deal about financial matters at school, families must be the source of quality information and essential lessons. With a little forethought and a willingness to seize teachable moments, you can be a positive influence on your children’s financial lives – starting at a very early age. 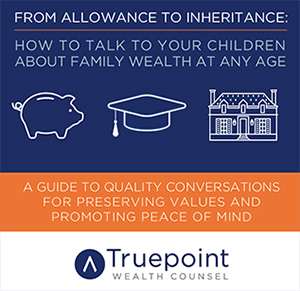 Download From Allowance to Inheritance today and contact a Truepoint wealth advisor to start the conversation.